In May of 2014, Virginia Tech and Wake Forest University School of Biomedical Engineering and Sciences conducted an independent study, the only study at that time and since that we (“SJSA”) are aware, which was truly independent and did not involve undue influence from any helmet manufacture. 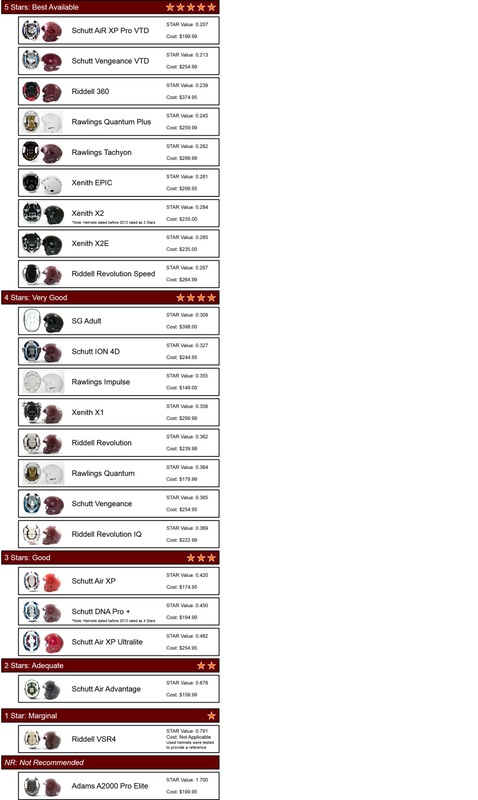 This analysis rated 15 helmets and provided a rating for each. The study can be found in the following location: http://www.sbes.vt.edu/helmet.php and is provided below for your convenience. A total of 23 adult football helmet models that have been evaluated using the STAR evaluation system are included in the Virginia Tech Helmet Ratings™. All 23 helmets included in the ratings have been made available to consumers at the time of publication. Helmets with more stars provide a reduction in concussion risk compared to helmets with less stars. Group rankings are differentiated by pre-determined thresholds. Note: Any player in any sport can sustain a head injury with even the very best head protection. This analysis is based on data trends and probabilities, and therefore, a specific person's risk may vary. This variation is likely dominated by genetic differences, health history, and impact factors such as muscle activation. Finally, no matter the product used for any contact sport proper fit for all products in use is essential; including a mouth piece that is rated and fitted properly to your players’ mouth. The bottom line is every parent should make their own informed decision regarding what is best for their player; utilizing whatever technology that is clearly safe to aid in protecting your player without increasing undue risk to other players. SJSA is committed to educating our coaches on the best practices including the USA FOOTBALL HEADS UP program, which ALL coaches will be certified on teaching proper tackling techniques, concussion management and other important specific football related topics in order to teach this game properly including any football products that may provide better protection for all players engaging in any sport SJSA offers.